New Hampshire is rich with opportunities for great paddling. Kayak racing in New Hampshire is a fast-growing sport and the offerings of events for those willing to accept the challenge of competition continue to grow each year. 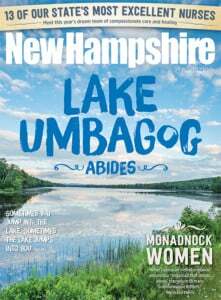 This month’s expert, Betsy Arnold, exalts the pleasures of kayaking here in New Hampshire, in part because of the very varied waters and conditions the Granite State offers, and because of the friendly group of people kayakers and racers tend to be. Squam Lake, made famous as the setting for the movie “On Golden Pond,” offers some of the best kayaking in New Hampshire with its calm waters, incredible scenery and variety of wildlife. Kayak rentals are easily accessible for folks wanting to try their hand at this fast-growing recreation. You can always rent, but should you choose to purchase a kayak, Arnold recommends a basic model. And if you can buy gently used, that’s not a bad idea either. The Perception Conduit 13.0 Kayak ($604.99) is a great paddler-friendly beginner model and features speed and tracking for longer paddles, storage room for gear and a keepers footbrace system. If you participate in any water sports, then expect your stuff to get wet. Keep the non-waterproof items protected in a dry bag that is reliable. The Air Purge Compression Dry Sack by Outdoor Research ($37.99) fits the bill with 10 liters of fully seam-taped Antron nylon and roll top closure. The air-permeable, waterproof fabric band purges air during compression. If you look long enough, you’ll find there are as many types of kayak paddles as there are reasons to try kayaking, but if you know the type of paddling you plan to do you can narrow down the options. The Werner Skagit Straight Shaft paddle ($129) featuring fiberglass/nylon blades is a great value for the beginner and more intermediate paddler alike. Delivering a smooth, stable stroke, the light swing weight reduces fatigue on longer paddling adventures. Arnold’s first kayak race was in 2004 and she’s been hooked ever since. She lives in Durham with her husband, one of their three children and their dog, Oscar. She’s a licensed clinical social worker, currently working on a novel series for abused children (under Cady Elizabeth Arnold). You can check out her website at thetapestrybooks.com. How and when did you first get involved in kayaking and how did you make the transition to racing? I lived in Gainesville, Georgia which was the kayak, canoe and rowing venue for the 1996 Olympics. After the Olympics, the Lanier Canoe and Kayak Club started teaching children’s clinics. My 6-year-old was invited to participate by a friend of his. I had always loved water sports and had been a lifeguard. The next thing I knew, I was roped into teaching kayaking. I felt like I didn’t know what I was doing, so I decided to learn to paddle the tippy racing boats in order to be a better teacher. It was a lot of fun and I got hooked. I started racing after I moved to Indiana.The United States Canoe Association (USCA) is strong in Indiana and the folks there were great. I had been paddling on a lake but they taught me to paddle on rivers and I found I loved going upstream. The Appalachian Mountain Club New Hampshire Chapter Paddlers offers memberships, rental info, instruction and everything any NH paddler could possibly need. The New England Canoe & Kayak Racing Association provides info on races, results and news for paddlers. A source for lists of some of the best places to kayak in and around New Hampshire. Do you think there is a special skill set for those that race kayaks? I think the skills of paddling can be taught, but I’ve found that the folks who become racers usually already have a competitive spirit or the “Go Fast” gene. Racing techniques can take a long time to learn so you need to be driven and you need to have patience. Because of that, it’s not necessarily a young person’s sport. Some of the most technical paddlers, such as Priscilla Reinertsen (president of NECKRA), can place a boat in the current with such precision that they’re tough to beat. People often come to canoe and kayak racing after an injury in another sport. They’re used to competing but can’t cycle or run anymore. Paddling is challenging, low-impact and highly competitive but the people are great and really help each other out. It’s a wonderful community. What would you say is your favorite race, the one you would hate most to miss each year? The first weekend in May is the Ashuelot canoe/kayak race, put on by race director Tom Warner. I love that one – even the year I didn’t do any racing because of surgery. I was pick-up boat for that one, which is the safety boat that follows all the racers at the back in case anyone has any trouble. It’s narrow and twisty and has some currents. You have to read the water and I really like to do that. Where will the current help me? Where will it hurt me? I tend to do better on those types of rivers. Priscilla holds a giant cookout afterward and it’s just a wonderful race and event for beginners and children. Can you share a memorable moment or two from one of your races? In racing, I’ve done just about everything wrong at some point or other. At the Nationals, in Bristol, Ind., I failed to double-check my equipment. The race started in the middle of a lake. Shortly after the gun went off, I went to take a stroke and my paddle pulled me into the water. I couldn’t swim to shore so I had to use my whistle to signal the rescue boat. They got me back in my kayak and I headed up the lake. Only then did I realize my kayak blade wasn’t properly locked together. I was so far behind at that point that I just relaxed and actually ended up paddling faster than usual. Toward the end of the race, on an upstream section, I caught up to and passed a friend. She hollered, “You, go!” even though I was passing her. Paddlers are great people — they want to beat you, but they are still pulling for you. What do you look for in a racing kayak and what other gear, safety and otherwise, are essential for successful kayaking? The first thing you should do is try any boat on the water before you buy it. You won’t know if it works for you. Kittery Training Post offers that sometimes. I’m 5'3" so I need a different kind of boat than a man who is 6'3", so it really varies depending on the paddler and it depends on the conditions. First, find out what kind of paddling you want to do — flat water, currents, ocean, etc. Some people start on kayaks with rudders and they only learn to paddle with that, but what if the rudder breaks? You need to be able to paddle a boat without all the bells and whistles. Safety is really important. Sadly, people do drown — even really experienced paddlers. I don’t get on the water without a lifejacket, cell phone and a whistle. When the water is cold, I carry a dry bag with extra clothes in case I get wet. Getting good equipment is important but it’s not enough.